As masters of non-verbal communicators, horses are the best teachers to help us achieve the Coaching with Horses training objectives and outcomes. Horses help us to understand that all communication is mutual and in order for communication to lead to behavioral change, it must be direct, personal and effective. Executives and their leadership teams, or managers from different departments in a company, work together with horses in the arenas and then transfer the skills they learned into their managerial life. Participants work through a series of exercises including leading the horses with a rope, guiding them around obstacles, working blindfolded and by touch, establishing respect and trust by achieving simple tasks. Groups generate their own ideas for change and improvement and as a result, participants become more resourceful, assertive and self-confident. Building a successful relationship with a horse relies largely on the development of mutual trust and respect but skills such as concentration, observation, and curiosity are also necessary. During the training sessions, Karin & Jana make a selection of diverse objectives to encourage these skills, including how to manage and care for a large animal. 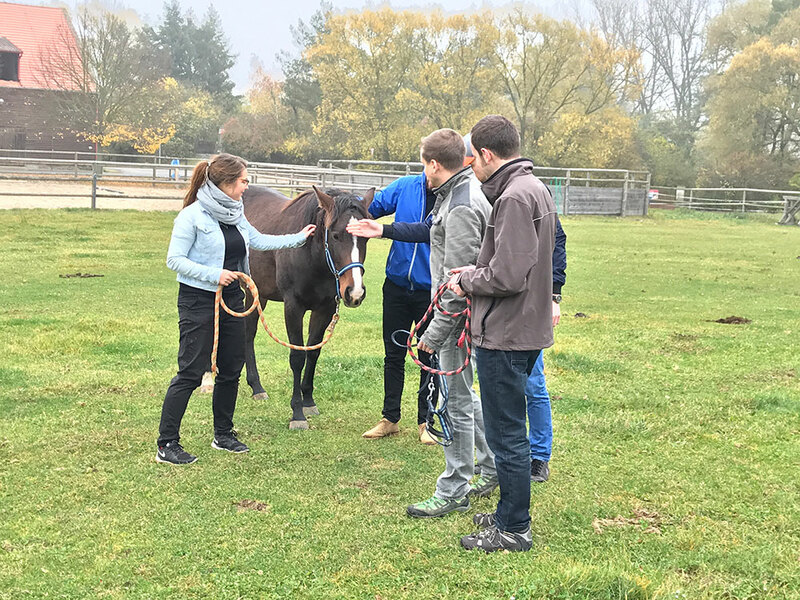 An experiential (hands-on) coaching experience involving horses as coach partners and teachers to learn more about yourselves and others and to develop your self-awareness. A unique opportunity to explore a diverse range of personal and professional issues in a creative and inspirational way, encouraging the development of verbal and non-verbal communication skills.